We love Christmas here at Home to Indy. Indianapolis has so many fun ways to get in the spirit: from Christmas at the Zoo to the Circle of Lights Tree Lighting to Christmas at Lilly House, there's something feative for everyone! The beloved classic of loss and redemption returns to IRT’s snow-covered stage! Dickens’ characters bring new life every season in this faithful, fanciful and frolicsome adaptation. It has the power to transform any "Bah Humbug!" attitude. Tickets cost $30-$67. In its 29th year on the Hilbert Circle Theatre stage, IPL Yuletide Celebration continues its holiday tradition. Renowned soprano, Angela Brown, and Broadway star, Ben Crawford, return to co-host this year's performances and will be joined by ISO artists-in-residence, Time for Three, Music Director Jack Everly, a brilliant cast of Broadway's best singers and dancers and, of course, your beloved Indianapolis Symphony Orchestra. Tickets cost $34-$55 for adults and $19-$40 for children. 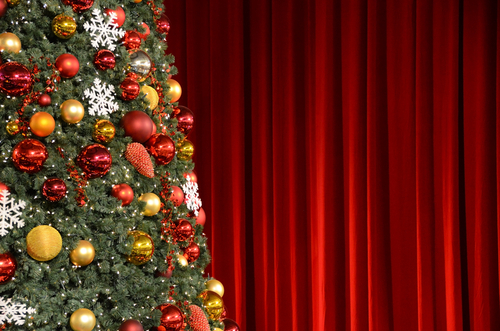 The Phoenix Theater boasts holiday sketches, songs and dances for its December show. They've got everything on your list: traditional holiday music, madcap comedy skits, and some very talented people to help you celebrate this most joyful—and stressful—time of year. They turn the holidays on their head with local and national playwrights putting a new spin on all things traditional. Tickets cost $35 for general admission and $22 for ages 21 and under. Beef & Boards celebrates in style with its annual crowd pleaser, A Beef & Boards Christmas. A glittering array of music and dance numbers, presented in a variety show format, create the perfect holiday tradition. Bring a group, bring the family, just don't miss it! From the pages of Dickens comes this delightful musical adaptation of the Yuletide classic with traditional carols. Experience the transformation of the crotchety Scrooge into someone who understands the true meaning of kindness and love. This one-hour show is performed without intermission and makes a perfect holiday lunch party for your club or office. Tickets are $24.50-$34.50. Elf: The Musical is the hilarious tale of Buddy, a young orphan who accidentally crawls into Santa's sack of gifts and is taken to the North Pole. Buddy is raised unaware that he is actually a human, until his enormous size and poor toy-making abilities cause him to face the truth. The heartwarming musical follows Buddy on a task of impossible size - can he reunite his new family in happiness, as well as bring much-needed Christmas spirit to the city of New York? Tickets are $49-$610. From traditional holiday shows, symphony orchestras, and Broadway, Indianapolis has them all this year to get you into the spirit. 'Tis the season!